As I’m sure most people reading this will know, Fedora is the free branch of Red Hat Linux, probably the largest Linux distributor around, at least in the enterprise market. As I mentioned I’ve used Fedora since the original Fedora Core came out years back. It was always an impressive system but I found it was often awkward to use as a main home desktop. Setting up things like multimedia codecs and proprietary video drivers was a bit of an effort, not massive but still not the sort of thing a novice user would relish. In the last couple of years I discovered Ubuntu and was wooed away from Fedora. So coming back to it with a fresh perspective how would I feel? I didn’t know. I chose to use the LiveCD version of Fedora 8 rather than the full DVD installer, partially because it was quicker to download and also because I thought it would be the best comparison to Ubuntu, which comes on one LiveCD. I booted up the disc and was greeted by the Fedora desktop. I didn’t even have to add the extra “noapic” option to boot as I sometimes do, it seems the quirks of my hardware were not a problem. I clicked the install icon on the desktop and followed through the numerous configuration screens, it was painless and the Anaconda installer worked perfectly. It installed the system in under 10 minutes which included a full reformat of my 200gb hard disk which surprised me. I did have to do a manual reboot of the system at the end as it didn’t prompt me to remove the disc and reboot, not a major thing but it’s such a little step it seems it would be easy to add. I restarted from the Gnome system menu and then was greeted with a configuration wizard on the first boot. This asked me for network details, user account information and so on. All in all the installation went very smoothly I have to say. You can see the slide show below if you’re interested. The first thing that strikes you about Fedora is the artwork, it’s beautiful and it always has been, even in earlier releases I thought. For me though true beauty runs much deeper than looks alone, nevertheless if you can’t abide an “ugly” desktop then Fedora will probably please you. I have to say though upon first login I thought to myself “oh look it’s Ubuntu with a blue theme”, it may be that Ubuntu copied Fedora or maybe it’s just not that easy to make one Gnome desktop look different to another I don’t know. Anyway, I’m a self confessed Gnome fan so it looked good to me. I was advised of some updates by the system which I tried to install but it failed and told me my network connection may not be working. This was unexpected, so I opened Firefox and loaded a few pages without trouble, it obviously wasn’t the network. I tried the updater again a couple of times and eventually it worked. It could have been a busy server I suppose with this being a new release but still it wasn’t a great first impression to make. I had a look through the menus and noticed that there wasn’t much software installed by default, well there wasn’t much of the stuff I usually expect in a new Linux desktop install anyway. OpenOffice was particularly conspicuous by it’s absence, along with lots of other things. The cupboard looked a little bare. So I opened the software manager from the main menu and searched for some of the tools I use, it found most of them but it took a long time going through different pages and ticking a myriad of check boxes. I installed a ton of stuff which obviously took quite a while to download, OpenOffice is over 100mb on it’s own I think. Probably the reason it was hard to fir on the CD. I left the system to it and went off to get some food. Upon returning I decided to try and fix the screen resolution, it was set to 1280×1024 which is no good for my display. I need 1440×900 and very few systems seem to offer that by default, it’s not a common requirement though I suppose. I opened the display settings applet and discovered I was using the standard VESA driver which is limited to say the least. I selected “nv” from the options to see if that would work for me, also choosing “Generic 1440×900 LCD” as my monitor type. After an X server reboot this gave me the correct resolution but I found I couldn’t enable 3D effects. It seems the driver wasn’t compatible. 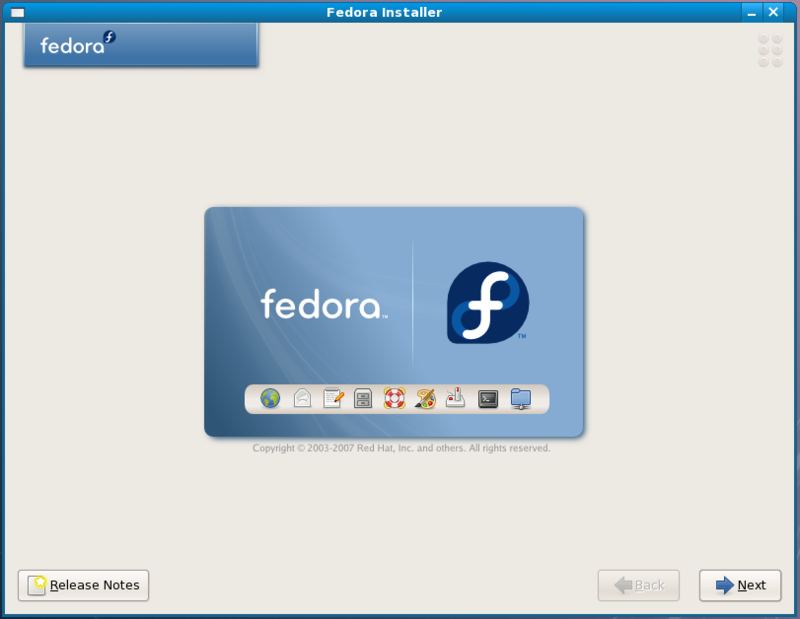 A quick internet search turned up this guide to setting up Fedora 8. It proved to be a life saver, I added the Livna repository to Yum in the terminal and installing the latest Nvidia drivers. This was a little fiddly and I’m not sure a novice user would be so keen but I got it done and soon had the 3D desktop working which was a relief. I found with the standard desktop the system slowed down a lot when changing workspaces or scrolling on large web pages. I’ve had this problem on other distros but the performance of Fedora seemed a little slow on my hardware, it also took a long time to open my external USB drive which is usually quick. Make of that what you will. I decided to try opening some multimedia files and it was then that I encountered the new Codec Buddy feature, it basically asks you to purchase the codecs required from Fluendo. It’s not expensive to do so but having always gotten the codecs free on other systems I was reluctant to part with any cash (no change there). I installed the free Mp3 decoder which worked. I then opened the software manager and searched for the appropriate Gstreamer plugins, the standard set up is the 3 packs of codecs, Good, Bad and Ugly. I found the Ugly set was not installed and got it from the Livna repo, even after that though I still couldn’t play Xvid video for some reason. I decided to just install the VLC player which has always proved to be a silver bullet for me. True to form it played the videos without the need for extra codecs. VLC really is a great tool I must say. I tried a few other things out, Firefox prompted my to install Flash but then failed to do so, even Debian did this for me without a complaint. Anyway, I went to the Adobe website and installed their RPM package which got Flash working. NTFS reading and writing worked flawlessly out of the box, nothing spectacular for a modern distro with the ntfs-3g driver but still worth a mention I think. I had a pretty fully functioning desktop by this time but it had taken me a while to get there. Perhaps I was a little rusty. Fedora uses the Yum package manager which works in a similar manner to Apt-Get on Debian systems or that’s the theory anyway. I’ve always had problems with Yum and it never seems to work properly for me, I know it is a powerful tool and in the right hands (possibly not mine) can do great things but it kept locking on me and crashing. We did not get along and we never really have. When you open the software manager it locks Yum so that other applications can’t use it at the same time, a sensible move for sure and the same thing happens with Apt. However, I found that the update service kept locking Yum up and it wasn’t keen to let go. I even rebooted the whole system thinking that would release it but it didn’t, it was still locked up. I searched around the Fedora Forums and found a fix thankfully, I was able to kill the yum-updatesd and yum-updatesd-he processes which released the lock but it was a bit of a hassle and I still kept getting dependency errors with the general updates on a daily basis. I also tried using Yumex the GUI front end to see if it helped but all I got was the same errors in a nice coloured window instead of a blank terminal. I’m sorry but to me Yum isn’t a patch on Apt, I’m a Debian fan and I admit that so maybe I’m biased but Yum is about as welcome around my house as haemorrhoids. Sorry, I have to be honest and that’s how I feel. I’ve heard you can install Apt on Fedora and I need to investigate that more I admit. Fedora is a good distro, it always has been but I don’t think I would want to use it as my main desktop. I know the Fedora fans wont like me saying that but I found it to be a bit buggy and it needed a lot of setting up. I know Ubuntu can be buggy too and Gutsy has definitely shown us that, so I’m singling out Fedora it happens with lots of systems. As a distribution it has some really great features such as SELinux to keep your system secure, the Pulse Audio which allows for some really neat manipulation of audio routing and one thing I really liked was the virtualization tools. 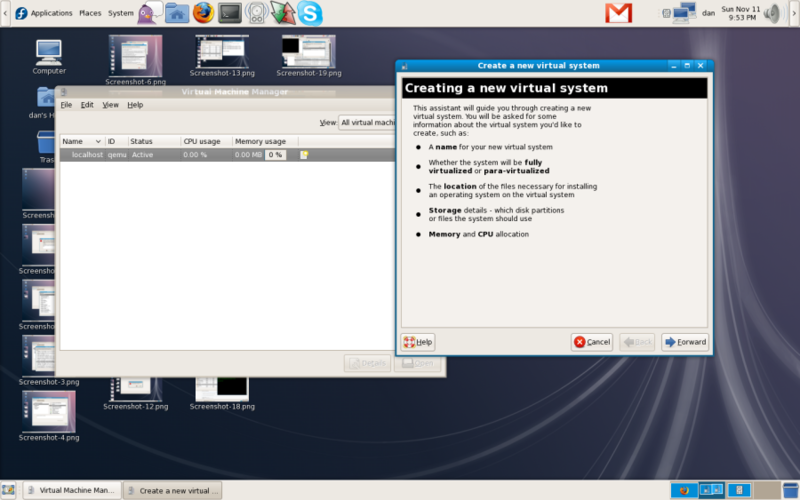 I tried the Virtual Machine Manager and liked it a lot, I had a good play with Qemu and Xen, that was great and credit where it’s due I was impressed. All of this brought me to the conclusion that this distro is really suited to developers, enthusiasts or perhaps server deployments. It seems to tailored that way, possibly because of the business focus of Red Hat I don’t know. It just feels to me like that the home desktop scenario is an after thought. If you want a development server or a machine to do work on it’s great but not for the everyday multimedia, internet and general playing about I think most home users want. It can do that don’t get me wrong but you have to know how to set it up and it seems like you’re fighting the system a little. That may just be my opinion though. Fedora is a very good system and I keep reiterating that because I know a lot of people will view as a negative review and really it’s not. Yes I had some problems with the system but it has a lot going for it and I think many people will love it. Especially anyone who values the aesthetics of a system as a major priority, it’s looks beautiful and I think in many ways they aimed very high with this release, it just seems they fell a little short in some areas. There’s nothing wrong with that, I admire the ambition and if you’re going to do something then you should go for it wholeheartedly. There were just a few bugs that I didn’t expect and Yum really got on my nerves. Maybe I could have tried harder and spent longer fighting with Yum I don’t know, I will accept that accusation. I should also point out that this was the LiveCD and a lot of the software I found to be missing like OpenOffice was probably removed because of space constraints, the DVD probably wouldn’t have this problem I suspect. Still, other LiveCDs seem to manage ok fitting everything in. If you want a web server, file server or any other kind of server really Fedora is a great option I think, maybe it would even work on the desktop for some people but for me I’m afraid it didn’t. With distributions like Ubuntu, PCLinuxOS and Mandriva around which do everything for you I don’t see many novice users choosing Fedora. I know a lot of people don’t like having things done for them and that’s cool. My intention in doing this little distro tour was to find the system that worked easiest on the desktop for the most people and against these criteria it didn’t do so well but against another scenario I think things might be different. EDIT: It seems I have one more distro to review for this series which I missed out, Linux Mint. Since the idea of this short series was to find the best thing to recommend to a friend new to Linux I have to give Mint a shot, even if it is still in beta. I’ll do that before the overview. Anyway, I’ve been interested in your reviews. I’ve been using desktop Linux for almost a year and haven’t settled on a “main” desktop distro. Would probably be Sidux if the Wine packages were more up date to run Oblivion. 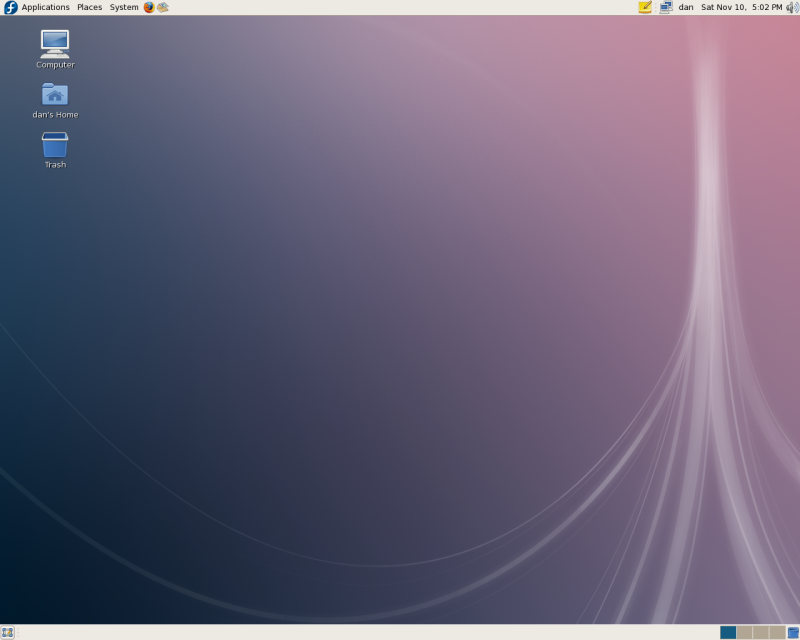 It’s a very customized and user-freindly version of GNOME Ubuntu. It has multimedia working out-of-the-box that even Cannonical is afraid to enable (libdvdcss). It also has a better update system. The “start” menu is upgraded, and the artwork is gorgeous. As you like a “just-works-out-of-the-box”, user-freindly distro, I doubt you’d find anything better than Mint. Thanks guys, I know quite a few people who use Mint and I do really need to look at it but I wanted to wait for the final release as I saw it was in beta and had some other stuff to get through first. Anyone know when it’s due for release? I will also look at some of the other distros people have asked about. Arch, Zenwalk, Frugalware, Vector and so on. In this series I wanted to find the best of the current distros to recommend to a friend who was interested in Linux, that’s why I wanted something easy. I will add Mint to that list as know it aims to be easy to use. You did a honest review from your perspective. Good you pointed out that Fedora primarily aims at being a workhorse and not a “play-station”, or as you stated: “really suited to developers, enthusiasts or perhaps server deployments”. Another factor is Red Hat’s and Fedora’s firm stand and principal about only using free software, or maybe more precisely software globally being untouchable by patent claims; something we have to respect. An important point that many seem to overlook is Fedora’s crucial role in testing out new features and new software, which by time will be adopted by other distributions. Hence folks mentioning Ubuntu or it’s derivations in the comments above, shouldn’t look at this as a Ubuntu vs. Fedora thing, because in the long run Ubuntu users are taking advantage of the enormous work the Fedora team is doing. PulseAudio is a typical example of software that Ubuntu developers want to integrate by default in their own distribution, but they’re not ready yet. Thanks to Fedora PulseAudio will get tested and probably improved a lot before Ubuntu takes it on. Because of Fedora’s principles it might be difficult for some to setup a multimedia ready system. When you know how, actually more which packages to install, Fedora proves to be a very polished well working multimedia platform. Actually I’ve installed Fedora for organizations depending on multimedia and conferencing features, with a result far over average compared to other distributions. Yes, yum isn’t the smoothest of installers, I fully agree. I’ve never run into the sort of issues you report though, but I wish it would have become at least faster. On the other hand I’m spoiled since I personally use packman in Arch from command line! Good luck in you ongoing quest! Yes that’s a good point and I neglected to mention it. Red Hat and also Novell do some important work upstream which many other distributions feed off, sometimes they don’t get the credit. Things like the Novell/Microsoft deal are something I personally don’t like and I’m not alone in that but it shouldn’t detract from the good work they’ve done for Linux. My only beef with Fedora is the fact that they push people into a “vendor lockin” situation with Codec Buddy via Fluendo. Given the fact that apparently Fluendo is the originator of that tool, I think the Fedora team did a very Microsoft like approach, as this is precisely the way M$ does things. Also, only a very small handful of these codecs are actually illegal to USE, despite the claims and FUD surrounding them — Its nothing more than that. The problem lies in the DISTRIBUTION of them. This is easily circumvented by offering them on free mirrors residing in locations where these patent laws have no teeth. I cant say much about the “right or wrong” of that, except that GNU/Linux has, is, and ALLWAYS should be about users freedom and choice of what software goes on their machines. Ubuntu and others have chosen to offer the codecs after many warning popups, and this is the more appropriate way to do things realistically, because the burden is placed upon the user legally this way and Ubuntu dodges all responsibility… Again, LOTS of legal precedence for this in the court systems. You could always use the livna repository. I think it’s great that fedora sticks to there guns with free software. More power to them! hey i commented before about gentoo, with garret telling about arch. just to warn you gentoo is not just hard to install, its very hard, from your comment i got the fealing that you would be as shocked from gentoo install as you where from slackwares everyday use..
BTW noticed how it is, first you think that you would review six distros then you discover a whole new world, the more you go the vaster the word seems, and it keeps getting bigger. start with gentoo, and you”ll discover lunar linux/source mage/ sorceror and r2, LFS. ohh and BTW2 for easy distros, you can try PC-BSD, its not the best there is, but being a BSD its worth a mention and a try. if ease of use is a factor, I’d stay away from the likes of frugalware, arch and gentoo. I didn’t find Arch too difficult to set up with the install manual by my side, but it’s still the kind of distro that requires more than a few days to tweak fully to your liking. The point of those systems is full control and opmisation of the OS to your machine and personal requirements and nothing beyond what you set up. I’d sooner look at the likes of Mint, Sidux, Dreamlinux, Elive and Zenwalk. The last four all bring something different to the table compared to other distros whilst being exceedingly fast and userfriendly. Thanks for all the suggestions guys, as for the “ease of use” requirement. It’s not something that I mind too much myself but my agenda with this series was to find what I thought the best distro to give to friend would be. Someone who didn’t know Linux, something to make a good first impression. Slackware really shouldn’t have been in there against those criteria as it’s not what the distro is about. Someone suggested it to me and looking back now I think they must have been winding me up. Anyway, I will definitely add Mint to the series as it’s a distro which aims at the new user market. In the future I’m happy to do some work with things like Gentoo, I don’t mind a challenge. It was the initial shock of not knowing what Slackware was that got to me. My fault for not researching it. I’ll continue to try all kinds of distros in the future. Maybe even BSD as it’s something I’m interested in. FreeBSD or PCBSD possibly to see what it’s like on the other side. That should be interesting. You mention that your initial ‘yum update’ failed. There was a brief network failure in Fedora’s primary datacenter the evening of the release which was rectified soon thereafter. I suspect you tried to update during that brief outage. The Fedora Infrastructure team will have more services in more geographically diverse datacenters for the next release thanks to some recent donations, which will avoid such problems. I have read all of these and even tried some of them myself based your reviews Dan. One of the things I like best about your reviews is you constantly maintain a neutral position and justify any negative comment with a reason (usually pointing back at yourself LOL). Your style is very professional and I have enjoyed them all. Regarding the comments surrounding codecs and Codec Buddy. Fluendo was chosen simply because they helped with the development of Codec Buddy. This can be easily replaced with another vendor or anything for that matter. The inclusion of codec buddy is to allow people to install codecs legally. Not having paid for codecs previously doesn’t make it magically legal to use. And not having been caught is again not an excuse to break the law. These codecs has patents surrounding them and codec buddy is there to aid in implementing these codecs without getting people into trouble. Fedora certainly doesn’t charge people for using OGG audio or video. So as you see, it’s not about charging people for codecs, it’s charging people for patent encumbered codecs. Fedora is developed with open standards and open source in mind. We have to see it that way. I think the problem a lot of people have with the codec situation is that a lot of them are only illegal in the US, not the rest of the world, like dvdcss. If we are not in the US why should we pay? I’m not an expert on this subject, far from it but I know a lot of people here in the UK don’t like the fact that these distributions assume we’re all in the US. A lot of these distributions are made in the US so I suppose it’s a difficult subject, I’ve heard this argument a lot here though. Not all codecs are legal in Europe either of course but when I installed Windows last, about 2 years ago I had to install the codecs for all kinds of formats, none of these were charged for and I was not told that any of them were illegal. What you do with your own system is of course up to you and it’s not for me to say what’s right or wrong. I’m just honestly saying what I do on my computer. That’s all. Yum works for me, but I turn off the yum-updatesd daemon and run it manually on the command line to update or install new software. This anti-American statement really was not needed to talk about Linux distros. But being A NASTY AMERICAN I will play along. I’d forgotten about that comment to be honest, I’ve removed it because I can see it will be offensive to a lot of people. As you say we don’t need to reduce ourselves to negative national stereotypes just to discuss Linux. Let’s stick to the technical discussions if possible. Well, I put my money where my mouth is, and tried the Final of Mint 4.0 Daryna. I must say, it just might tempt me away from the werewolf (a proud Fedora user here, from way back in the day…). It just seems to get everything right, and the 1-click install system is great. The conclusions the author of this review reaches are debatable. Comparing Fedora 8 to Ubuntu 7.10, I think Fedora comes out ahead. I would never have said that for Fedora 7 vs. Ubuntu 7.04, but both distros have changed…Fedora for the better, Ubuntu for the worse. Fedora 8 installs on the hard drive in about 10 minutes, making it among the fastest installs I’ve seen. Whereas Ubuntu took me over 20 minutes to install. And Fedora has numerous advantages such as Selinux on default, a firewall gui on default. But most importantly, Fedora includes Red Hat’s “liberation” fonts which make the Fedora fonts much more readable than the default fonts on Ubuntu. I was a loyal Ubuntu fan of 7.04, but the 7.10 has too many bugs and shouldn’t have been released until those bugs were fixed. Finally, for open source “purists” Fedora 8 comes with no restricted drivers, making it a true open source distro. I would certainly agree that Ubuntu 7.10 is a buggy release. The problems with IPv6 are shocking and that’s the tip of the iceberg. 7.04 was a great release but 7.10 has fallen a little short for me. I’ve noticed that quite a few distros choose Gnome as their default desktop. I don’t get it : did the KDE team insult the parents of all distro maintainers ? Considering the amount of work that goes into KDE, is there a technical reason to ignore it ? Good question, I thought there were a lot of distros choosing KDE to be honest though, possiblymore than Gnome but I’ve never counted. I think it’s just an individual preference really. Personally I like Gnome but everyone is different. PCLinuxOS, simpyMEPIS, Sabayon, Mandriva and many others choose KDE as default desktop. I think it’s about 50/50 overall probably and of course you can install the window manager of your choice on any distro normally. Results can vary but it’s an option. in any case wether people notice that or not, the existance of all the wiindwo managers and enviormants affects as all, a good example is me, i prefered gnome but sometimes the philosophy of kde (put as much feutures and options and apps as you can :P) makes stuff like amarok, wich just have so many good stuff that wouldnt be archived by a minimalist philosophy, and then stuff like exaile (something like gnomes amarok for those who dont know) would exist. on the other hand gnome is essetional for those who dont like their system bloathed. and fvwm, wow xfce’s manager is based on fvwm, and so many others two, and the many incoporated options probably affected even those manager that didnt share stuff from fvwm source. *boxes probably affected windows manaers a lot two, and im sure that rox also helped, and the list can probably go on. the thing is that it doesnt matter what you like, the choise is important and it affects you always, even if you choose to use only one, distro and WM’s wars are stupid..
BTW dan you should really try xfce, i love it, it has everything gnome has but works better (less resources) even thow i prefer fvwm cause im an ultra minimalist, and i like my comps efficient so i use fvwm, but still i needed file managers and other stuff, and just used what xfce provided, felt just like gnome. BTW2 im the smae guy that used and commented about gentoo if you remember. I hope to get the Mint review done 2moro so keep an eye out for that. HI there..To be taken ‘seriously’ you really should keep your dictionary handy and be more attentive to detail on grammar. see that..edit your review at least on that count and I ‘might’ take you seriously but atm.no thanks Ill look elsewhere. I agree with your statements about Fedora 8. But I’d be curious what you think about CentOS or some other Red Hat clone. And, about reviewing FreeBSD or PC-BSD: you should take DesktopBSD into account for a fair comparison when it comes to desktop use. I loved RedHat some years ago. But after that proprietary issues came up I stopped using it anyway, though I test the new releases for a day or two. Last I tried Mint 4 Daryana and PCLinuxOS 2008 MiniME. I bet Mint and PCLinuxOs is going to rule the desktop Linux. Mint has already proved its versatility, and PCLinuxOS MiniME seems very great, hope the next Big PCLOS will improve it further. Waiting for your reviews on these two great desktop linux distros. Thanks for the great review, Dan. I still appreciate all the work you did in reviewing so many distros. I’m a bit late to the Fedora 8 party, but I thought I’d just post my experiences with it. Your reviews helped me to pick out Debian for my desktop, but I’d also say you helped me to pick out Fedora for my laptop. I have an older laptop – an HP Pavilion ze4800, to be precise – and I intended for it to be a strictly-work machine. Mint was my laptop distro of choice for a good while, because it was easy to use and didn’t require a lot of aggravation in the setup, particularly in point of wireless drivers and Compiz. 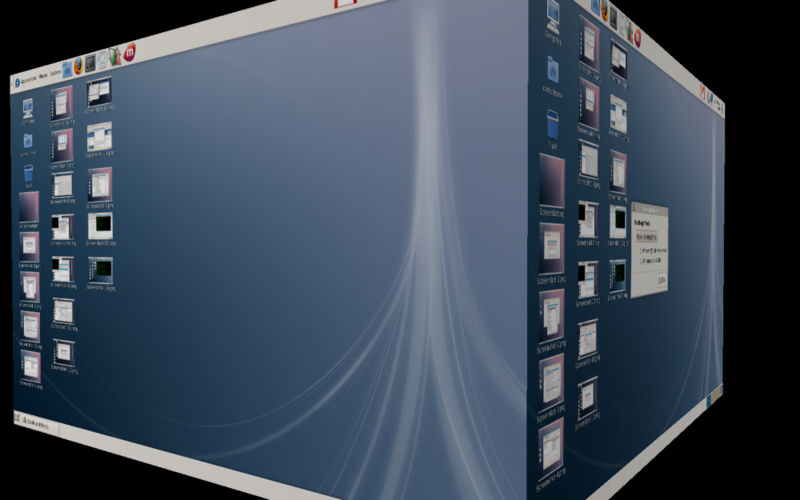 But over time I was less productive than I could have been with Mint, mostly because I was excessively fiddling with Compiz Fusion, Avant Window Navigator, and so forth – the graphical eye candy which is cool to look at but eats up resources and does nothing productive. One point that really aggravated me about Mint (and Ubuntu on the laptop before that) was the issue of boot time, suspend, and hibernate. Under Ubuntu, I could not suspend or hibernate the laptop, and it took forEVER to boot. So obviously its days of service on my laptop were numbered. Thus came the switch to Mint, which had much better boot times. But suspend and hibernate remained non-functional, and that was still quite an annoyance, though somewhat mitigated by the faster boot times. I heard that some RPM-based distros, especially ones with commercial backing like openSUSE and Fedora, had better laptop support. Possibly because distros with more commercial backing realize the importance of mobility to business folk? So I decided to torpedo Mint and give the RPM-based distros a whirl. openSUSE was, to put it politely, impossible to install. I don’t know what I was doing wrong, but it pointedly refused to install on my laptop. The installer kept hanging in the same place, and the laptop overheated so badly that it shut off without any warning – at least five times. Not knowing what else to do, I abandoned openSUSE. But Fedora remained, and so – despite your warnings about yum, Dan, I decided to give it a go. I’m pleased to report that Fedora installed nicely, although it really did take quite a while to install (I used the full DVD installer). I had some trouble getting wireless Internet access to work – the console seemed unresponsive to some commands I was giving it (as I was following a HOWTO on ndiswrapper in Fedora 8). So I got frustrated and shut it off. I logged back in later, but somehow – magically! – ndiswrapper was working and I was able to connect wirelessly. I don’t know what I did right, but it works and that’s good enough for me. Last, but not least – suspend and hibernate. I’m sorry to say that suspend still doesn’t work for me on my laptop, but Fedora is the first distro I’ve installed on this laptop on which hibernate worked out of the box. (That’s something Mandriva, Mint, Ubuntu, and PCLinuxOS couldn’t do for me.) I’m sure that newer laptops are probably better-supported than this four-year old laptop, and so I might have better luck with one of those distros on a newer laptop, but there’s no question that suspend and hibernate are really important for a laptop user, and Fedora has been able to deliver where other distros have come up short for me. So I’m sticking with it on my laptop. I suppose that suspend and hibernate could be made to work with lots of time and effort on other distros, and I’m not trying to denigrate those other distros for that reason. But practical, everyday life concerns won’t let me spend unlimited time trying to hack an OS, and I’m not sure I have the aptitude for that task anyway. So Fedora it is for me, and I have to say I like it a lot. I also can’t abide an ugly GUI, and Fedora’s GNOME desktop is a really nice one. Big plus. It’s aesthetically pleasing, but not distracting. All the better for productivity! So I do agree with your intuition, Dan, that Fedora is meant more for work and less for play. That is something that one really ought to consider, I think, when they are deciding what they will use their computer for. Wow that’s a great comment thank you Justin, I’m glad Fedora worked out well for you 🙂 I’m surprised Mint gave better boot times than Ubuntu as they are essentially the same under the surface I thought. Certainly in boot set up but I could be wrong.